If you want to get glowing skin naturally, you should use natural ingredients. Another great plus in the favor of homemade beauty remedies is that they will help you save a fortune. It’s also a much healthier option to use natural products to make your skin glow. The staples you have in your pantry are more than enough to help you deal with a variety of skin ailments, like acne or flaking. You can also use them to slow down aging by offering your skin more hydration, nutrition, and elements that stimulate the production of collagen. Your skin becomes too oily if your sebaceous glands do not work right. This usually happens because of inflammation or hormones. Note that sometimes your skin is simply prone to oiliness naturally, so you can do nothing but to learn how to manage it most effectively. Honey, oatmeal, eggs, and lemons are the best ingredients for DIY natural remedies. Aloe Vera is also an extremely helpful plant that you definitely should start growing if your skin is oily and prone to acne breakouts. Tomatoes will also help in these situations because they contain salicylic acid, one of the most common ingredients in anti-acne products. You’ll need to develop an effective skin care routine to keep the production of oil at bay and make sure you stick to it at all times. When traveling, stock up on the essential products. Stress from the journey, new foods, and lack of proper care might cause a breakout that will put a damper on your holiday. Apply raw honey as a face mask and let it dry on your skin. Wash off with warm water after about 10 minutes. Depending on your needs, you can apply the mask topically on pimples. Make a face mask combining an egg white and a teaspoon of fresh lemon juice. Apply on your skin and leave for 10-15 minutes. This remedy will tighten pores and help remove blemishes. Lemon juice has whitening properties, so it’s a good remedy for fair skin. Make a scrub with a spoonful of almonds and two tablespoons of honey. Grind the nuts as fine as you can and use the scrub once a week. Store it in the fridge. If you have a blender that can process almonds into a smooth paste, you can also mix it with honey and use as a face mask. 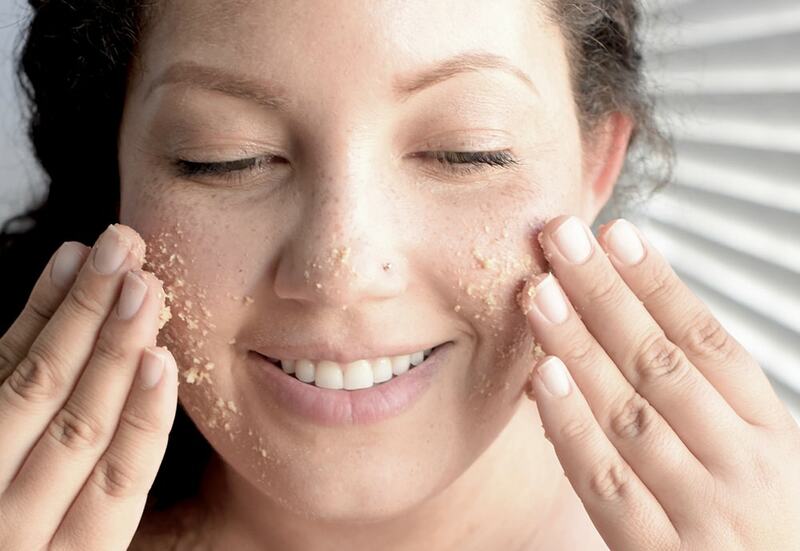 Make an oatmeal face scrub if your skin is too sensitive for almonds. Mix lightly ground oatmeal with honey and exfoliate your skin. You don’t even need to rub the substance into it. Simply apply, let dry, and wash off with warm water and circular motions. As you can see, the majority of homemade remedies for face hinge on mixing something with honey. So you can use this principle for any other ingredients as well to get glowing skin naturally. Cut a leaf of an Aloe Vera plant and apply the gel onto the problem areas of your skin. Watch out for reactions as this substance is quite potent. Wash off with cool water. If the remedy works well for you, you can leave the gel overnight. Mash a small tomato and mix it with some sugar or honey. Apply over acne or your T-zone for five minutes and wash off with lukewarm water. It’s not easy to get glowing skin naturally if it’s dry by default. This skin type is very sensitive and prone to becoming flaky. The latter is a particular challenge when applying makeup as no foundation or a similar product can cover that up perfectly. All skin is getting drier with age, which is one of the reasons why you develop wrinkles. This means that effective hydration is doubly as important for you. The good news is that homemade beauty remedies for face are most effective for this condition. In fact, these products can be more effective than expensive store-bought products. You also need to know that diet has a significant effect on this condition. Research published in the Journal of Dermatological Science states that drinking milk regularly can help relieve extreme dryness. You also should look into the general tips to look beautiful naturally. A change in your lifestyle can ensure that the relief you get with the help of DIY beauty treatments lasts. Due to its extreme sensitivity, dry skin is prone to redness. Check out this post to learn how to reduce redness and get glowing skin naturally. Best ingredients to make dry skin healthy and smooth at home are oils, honey, Aloe Vera, and oatmeal. Avocadoes are also fantastic for dealing with flakiness and dryness. As you can see, honey and oatmeal are some of the main ingredients when it comes to homemade beauty tips for face. This means that these ingredients can help you combat a variety of skin problems, so don’t be afraid to use them anytime. Make a face mask from a mix of oatmeal and honey. Keep it on your face for 15-20 minutes and wash off with warm water. This will help you relieve skin irritation and soothe your skin if it gets inflamed. You can also think of this mask as a deep conditioning treatment for the face. Apply coconut oil to the flaky and extremely dry patches of your face. You can use it once a day (preferably before bed) instead of a cream. This will work best for winter when your skin needs extra moisture and protection. Mix a tablespoon of warm melted honey with 1-2 tablespoons of milk and apply the mixture on your face. If you can, you can even take honey & milk bath, like Cleopatra. Make a lotion from equal parts honey, olive oil, and lemon juice. 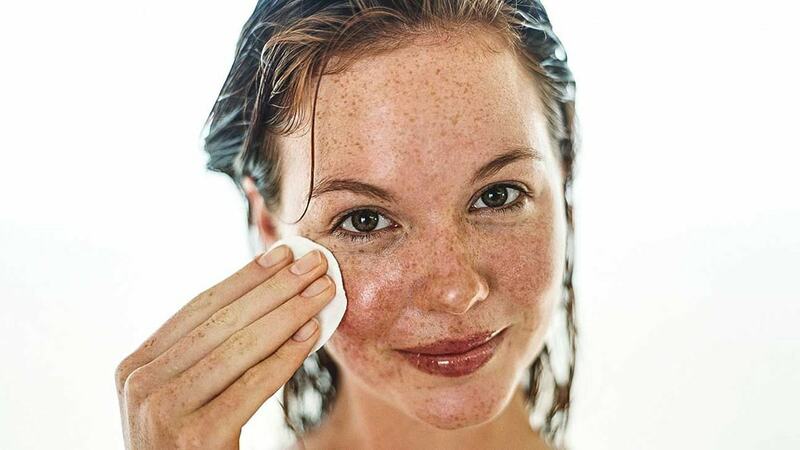 Apply to the problem areas on your face and body and leave for 20 minutes before gently washing off. Make a quick face mask by mixing 2 tablespoons of fresh watermelon juice and a spoonful of honey. Leave it for 10 minutes and rinse off with cool water. Do this twice a week during the summer to moisturize and freshen up your skin. Use fresh pineapple juice (1-2 tablespoons) mixed with a few drops of olive oil as a peeling instead of a scrub. The enzyme bromelain will remove dead skin cells without damaging your face as scratching it with solid particles would. Leave the juice for 20 minutes before washing off with lukewarm water. To get glowing skin naturally, use this remedy 1-2 times a week. Image SourceIf you are one of those few lucky girls with normal skin, you can make your face glow with very little effort. You should also take note of the tips in How to Increase the Beauty of Your Face Without Any Surgery. This post will tell you everything you need to know to keep your skin healthy and beautiful. A moisturizing or a nourishing mask 1-2 times per week with a light exfoliation weekly are all you need on top of the daily skincare routine. You have a lot of flexibility with the homemade remedies you can try because anything will help enhance the natural beauty of your face. Make ice cubes with unsweetened green tea to wake up your skin in the morning or cool off on a hot summer day. This will have a nice anti-aging effect due to antioxidants in green tea. Use homemade toner made of diluted apple cider vinegar (1:1 or 1:2 depending on your skin’s reaction, make a more diluted version first). Store it in the fridge and use daily to give your skin extra nutrition and enhance its healthy glow. This treatment should also help if you have combination skin. Steam your face over a bowl of hot water and cover your head with a towel to trap steam under it. After a few minutes, when your pores are completely open, pat yourself dry with a soft towel and apply a thin layer of castor oil over the face. Got to sleep and resume your natural routine in the morning. This will provide nourishment and hydration to your face. Make a fruit mask by blending a few pieces of whatever fresh fruit you have access to. Add some berries if you can and honey if you want more nourishment. This is one of the most universal household beauty tips for face because no matter the ingredient combo, it will benefit your skin in some way. Wash the mask off with lukewarm water after 15-20 minutes. Mix a tablespoon of olive oil, an egg, and a teaspoon of honey into a smooth paste. Leave the mask on your face for 20-30 minutes and wash off with warm water thoroughly. Use this every 1-2 weeks to keep your face young and healthy-looking. Using the contents of your kitchen to enhance your beauty is always a great plan because it’s cheap and natural. People have been doing this for millennia and as legends about the beauties of old are still alive, this method definitely works. However, it’s essential to understand that due to the versatility of recipes, not all of them will work equally well. Skincare products are always tricky and their effectiveness for a person depends on many factors. Those include but aren’t limited to your diet, health, environment, and lifestyle. This means that in order to get glowing skin naturally, you should try a variety of recipes. Evaluate their effectiveness for you personally and stick to the ones that work best. Feel free to change the ratios recommended by recipes to make them more suited for you personally. You should also remember that you can always replace some of the ingredients. Overall, experiment until you find the perfect formula for you. Consider sharing it with the world afterward so it can help others who are facing the same problems. Do you agree that it’s a good plan? What are your favorite homemade beauty remedies? Have you ever had negative experiences with natural skin care products? Please, share in the comments below!